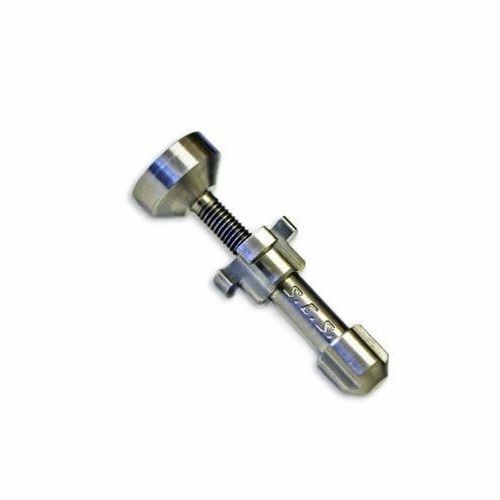 Santa Cruz Sheredder's adjustable titanium nail is made in the USA with stability and efficiency in mind. This titanium concentrate tool has a large thick head with a beveled bowl and tapered bottom to help it heat up quicker and retain heat longer. This means less time and energy heating your nail and more time dabbing and dunking. Direct airflow paths line up perfectly with grooves in the counterweight to create better suction when using the Santa Cruz nail. The 2 piece adjustable design can lengthen or shorten the nail so that it can easily be used with most 14mm downstems, even custom rigs. This authentic Santa Cruz Shredder nail of course has the "S.C.S" imprint in the shaft to boast its authenticity and California origins.